This past week the fishing has gone from good to fair and I have gone back to fishing strictly live bait. The water temperature has definitely slowed the fish down. When out on Lake Texoma fishing watch your depth finder carefully. 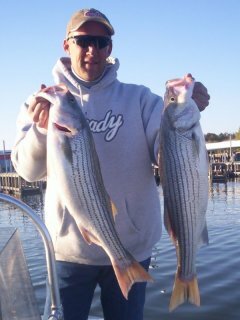 If you see the fish super thick on the bottom in deep water such as the river channels, normally indicates that these stripers are not on the feed and you will be wasting your time trying to catch them. The high winds the past few days has made it difficult to get to where the fish are. Saturday was tough, we fished from 9:00 – 3:30 and finished the day with 16 fish. We caught all our over 20" stripers but had to be on the move and work hard to catch fish that would eat. Sunday was a much better day weather wise but the fishing was just as tough. We ended up with 12 good sized fish, the biggest a good looking 8 lber. Monday was windy again. We found fish in 54 feet of water put an anchor down and the fish went crazy. We had two boats tied together and the fish and both boats limited out with steadily biting fish. With the winds blowing 25-35 mph, I would have thought it would have been a tough day of fishing. Just goes to show that you never know…. With some good sunshine and warmer winds the water temperture will start to rise and the fish will be on the prowl. Just in time for "SPRING BREAK" and a great time to get away from that dreaded cabin fever.